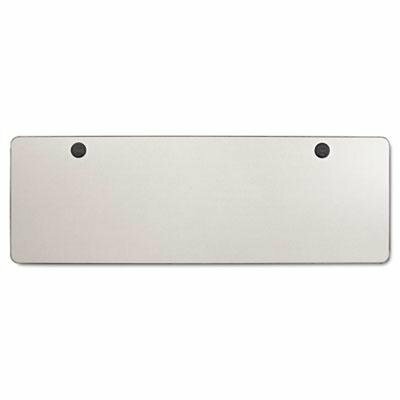 Valencia Series Training Table Top Rectangular 71w x 23-5/8d Speckled Gray - Durable 1" thick laminate with a protective 3 mm PVC edge banding. - Water- scratch- and dent-resistant for long-lasting use. - Access grommets and wire troughs keep cables neat and organized. - Matches finishes of Valencia Series modular desking components. - Top and Base sold and shipped separately—ORDER BOTH. - Top Color: Speckled Gray Top Shape: Rectangular Top Thickness: 1" Overall Width: 71". Balt - Iflex Series Full Table-Left 65W X 31D X 29H Cherry/Black "Product Category: Office Furniture/Meeting/Training Room Tables"
Balt - Iflex Series Full Table-Right 65W X 31D X 29H Cherry/Black "Product Category: Office Furniture/Meeting/Training Room Tables"
Alera - Valencia Flip-Down Training Table Base Modesty Panel 58W X 19-3/4D Black "Product Category: Office Furniture/Meeting/Training Room Tables"
Iceberg - Officeworks Mobile Training Table Trapezoid 48W X 18D X 29H Mahogany/Black "Product Category: Office Furniture/Meeting/Training Room Tables"